It was the latest Updates about crocodile that caught in Philippines. Some think that one of the best place for crocodile sanctuary was the Philippines. If you can remember the 21 feet long salt water crocodile was caught alive in Philippines last year. And after that, a thorough surveillance of catching or finding some kind of big crocodile came, because they are telling that lolong the 21 feet long salt water crocodile has a wife and it maybe more bigger than Lolong. After a thorough surveillance not only on place were Lolong was found, also on some other place of the Philippines. But unfortunately the surveillance team didn't find the said to be Lolongs wife. 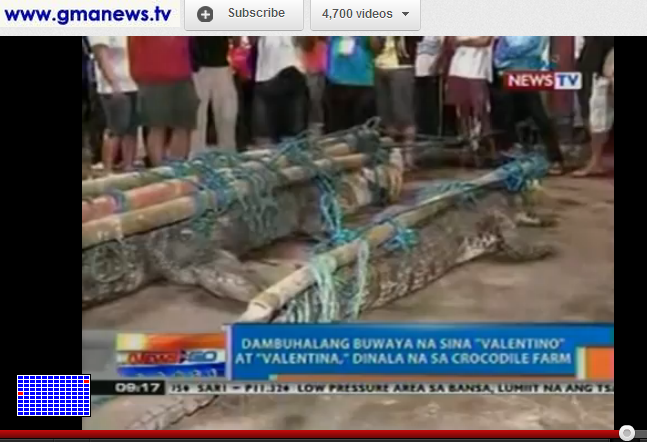 On last week Feb 15, 2012, a team caught another two giant crocodiles in Bataraza Palawan Philippines. The boy crocodile approximately 40 yrs of age, 16 feet - long, 500 kg as almost equal to 10 sacks of rice, and the other one is a girl 11 feet long. They name this two reptile as Valentino and Valentina. Valentino was suspected on attacking a farmer. They suspected this reptile because of the tag, which is the cut on its tail. Now the two dangerous reptile was brought on crocodile farm in Puerto Princessa from Palawan Philippines, almost 5 hrs of rides.. If you can remember last year a 14 feet long giant crocodile also caught in Bataraza, and is currently on crocodile farm. The largest crocodile in the farm is named “Surigao”, which was captured in the place it was named after 10 years ago.